You can hear through your ears, but to listen, you also need your eyes. Listening is not an art, it is a science, with sensitivity of an art. And most people listen poorly not because ‘they don’t want to’ but because ‘they don’t know how to’. 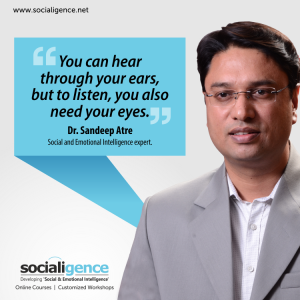 In fact, if someone has a commonsensical view that ears are where the listening takes place, they literally can’t ‘see’ the fact – Ear will hear, but the only way to listen is to involve eyes. Collecting information:We all have heard phrases like ‘see it for yourself’! We say so because out of all our senses through which we take inputs, the ones coming from eyes are most reliable ones. For instance, while talking to a kid, when you say something that invokes disbelief then the child looks at your face to confirm or further understand that point. Paying attention: Think about how you feel when you are talking to someone and the person doesn’t look at you. Well, although the person might be hearing every word of yours, you still feel that the person is not paying attention. Yes, mind is most engaged by the inputs coming from eyes, and thus when someone maintains eye-contact, we consider them to be more sincere, sociable and ‘there’. Thus, the best way to listen is to receive the factual aspects through words, and to receive the emotional aspects through the vocal cues and nonverbal behavior – gestures, posture and expressions. Then, the subconscious intermingling of these inputs leads to true empathy. In other words, the ears and the eyes come together to let the most important act of interpersonal communication take place – listening.